Clark Oderth Olofsson (later known as Daniel Demuynck; born 1 February 1947 in Trollhättan, Sweden), is a Swedish criminal now living in Belgium. He has received sentences for attempted murder, assault, robbery, and dealing narcotics and has spent more than half of his life in correctional institutions in Sweden. Olofsson has been called Sweden's first "pop-gangster". 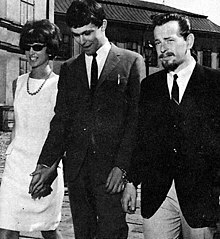 Clark Olofsson on his way to court in 1967, with his fiancée at the time (left) and a policeman (right). Olofsson was present at the Norrmalmstorg robbery whose events resulted in the creation of the phrase "Stockholm syndrome" to describe them. Olofsson was born into a home where both parents were alcoholics. When he was eight years old, his mother became a single mother, taking care of Olofsson and his two younger sisters. Her problems led to the three children being placed in foster care. When his mother regained control of her life, and started working in a shop, the children were returned to her care and they moved to an apartment in Hisingen, Gothenburg. For several petty crimes, sixteen-year-old Olofsson was placed in a behavioural institution for young offenders in 1963. Olofsson and two other boys escaped from the institution in August 1965 and entered the country estate of Swedish Prime Minister Tage Erlander at Harpsund, where they stole grapes, cucumbers and tomatoes from the greenhouse. They fled when the gardener discovered them. Three months later Olofsson assaulted two police officers in Eskilstuna. On 4 February 1966, he was sentenced to three years in prison; this was his third sentence and his first real prison sentence. In late 1966, he made his first escape from the prison at Tidaholm. On 29 July 1966, police officers Ragnar Sandahl and Lennart Mathiasson responded to a burglary at a bicycle shop at Skjutsaregatan in Nyköping. Sandahl was shot and killed by Gunnar Norgren. The other burglar was Olofsson, who became a nationally known criminal. Norgren was arrested on 16 August that year in an apartment at Utåkersgatan 4 in Gothenburg and later confessed to the murder. The apartment belonged to a boyfriend of Olofsson's sister. Olofsson had escaped from the apartment before police entered and managed to elude them for two weeks until he was captured on 25 August. He was sentenced to eight years in prison for his role in the break-in, and Norgren was sentenced to twelve years. On 4 February 1969, Olofsson escaped from prison and fled to the Canary Islands. He was later arrested in an apartment in Frankfurt. On 5 August, two months before he was to be released, he escaped again from an open institution in Bohuslän. In the early 1970s, Olofsson was imprisoned at the Kumla Prison. On 2 February 1973, he was arrested in the dining room of the Kurhotel in Ulricehamn. Police had received a tip from a cleaning-lady who had seen a gun in his hotel room. At the time of his arrest he had been on the run for seven months and had robbed a bank in Gothenburg. In May 1973, he was sentenced to six years in prison and transported to the Kalmar Prison. In late 1973, Olofsson was incarcerated at the Norrköping Prison when bankrobber Jan-Erik Olsson took hostages at Kreditbanken at Norrmalmstorg, Stockholm. Olsson demanded that Olofsson be allowed to come to the bank. Olofsson was brought to the bank, where he spent the next six days with the hostages. This event subsequently led to the creation of the phrase "Stockholm syndrome". He escaped from the Norrköping prison on 20 March 1975. In April that year he went into a bank in Copenhagen with a gun in each hand, fired a warning shot, and robbed the bank of SEK194,000. Olofsson, Clark (1986). Rättvisans lotteri [The lottery of justice] (in Swedish). Stockholm: Prisma. ISBN 91-518-2030-7. ^ a b c d Helin, Jan (1 May 1999). "De stal Erlanders gurkor – och sköt ihjäl en polis". Clark – historien om en brottsling (in Swedish) (2). Aftonbladet. p. 1. Archived from the original on 11 February 2016. Retrieved 12 July 2015. ^ Kordon, Suzanne (21 May 2000). "Det är ingen idé att ångra något" [There is no use in regretting anything]. Aftonbladet (in Swedish). Retrieved 10 July 2015. ^ Josefsson, Jessica; Lapidus, Arne (20 July 2008). "Clark Olofsson riskerar 16 års fängelse" [Clark Olofsson risk 16 years in prison]. Expressen (in Swedish). Retrieved 10 July 2015. ^ a b Svensson, Per (2015-02-02). Den leende mördaren: Ett reportage om ondska i vår tid (in Swedish). Albert Bonniers Förlag. ISBN 9789100152130. ^ a b Lidén, Svante (17 April 1998). "Han har suttit 23 år i fängelse" [He has served 23 years in prison]. Aftonbladet (in Swedish). Retrieved 10 July 2015. ^ Dalin, Eva (28 July 2006). "40 år sedan polismordet". Södermanlands Nyheter (in Swedish). Archived from the original on 24 September 2015. Retrieved 12 July 2015. ^ Södermanlands Nyheter, Sweden. "40 år sedan polismordet". Archived from the original on 24 September 2015. Retrieved 12 July 2015. ^ a b "Jakten på Gunnar Norgren" [The hunt for Gunnar Norgren] (in Swedish). Archived from the original on 9 November 2009. Retrieved 10 July 2015 – via National Library of Sweden. ^ a b Helin, Jan (1 May 1999). "Jakten blev ett folknöje – myten Clark var född". Clark – historien om en brottsling (in Swedish) (2). Aftonbladet. p. 2. Retrieved 12 July 2015. ^ Johansson, Peter (18 August 2008). "Det är jag som brukar styra och ställa på kåkarna". Dagens Juridik (in Swedish). Retrieved 12 July 2015. ^ a b Tures, Ewa (12 April 2015). "Clark Olofsson skriver en trilogi om sitt liv". Expressen (in Swedish). Retrieved 12 July 2015. ^ "Clark Olofsson gripen i Apelviken". Borås Tidning (in Swedish). Borås. Tidningarnas Telegrambyrå. 20 July 2008. Retrieved 12 July 2015. ^ ""Jag har en miljon under bordet" - Clark Olofssons resor i Sjuhärad" ["I have a million under the table" - Clark Olofsson travels in Sjuhärad]. Sveriges Radio (in Swedish). 22 August 2008. Retrieved 10 July 2015. ^ a b "Clark Olofsson stal allt han kom över vid gisslandramat". DN.SE. Retrieved 12 July 2015. ^ Helin, Jan (3 May 1999). "Under vild flykt träffar han Marijke, 19" [During wild escape he met Marijke, 19]. Clark – historien om en brottsling (in Swedish) (3). Aftonbladet. Retrieved 10 July 2015. Gadd, Pia; Olofsson, Clark (1991). Att aldrig gå loss: mekanismerna som gör fängelserna självförsörjande : samtal med Clark Olofsson [To never break free: the mechanisms that makes prisons self-sufficient: conversations with Clark Olofsson] (in Swedish). Stockholm: Carlsson. ISBN 91-7798-485-4.